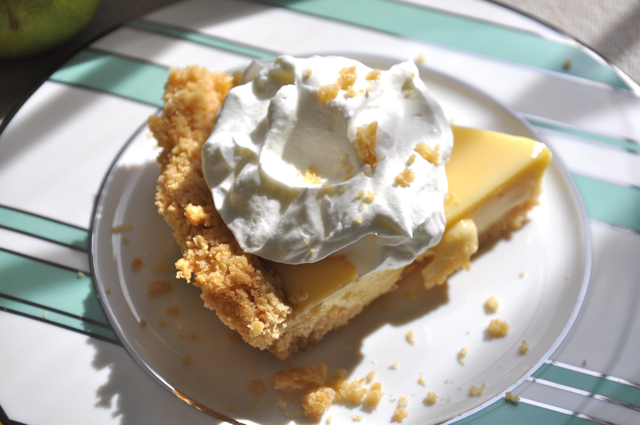 I know you never do this, but I was meandering around the internet last week, doing a perfectly fine job of putting off whatever it was I was supposed to be doing, when I stumbled across a mention of a dessert called Atlantic Beach Pie. It caught my eye because Atlantic Beach – the one in question – is in my own backyard, a couple of hours up the North Carolina coast from here. What the heck, I wondered, was Atlantic Beach Pie? And why hadn’t I heard about it? Enter Bill Smith, the Chef at Crook’s Corner restaurant in Chapel Hill, North Carolina. All mentions of Atlantic Beach Pie seem to lead back to him, the fellow who apparently rescued the recipe from the obscurity of church cookbooks and small eateries and thrust it into the limelight. 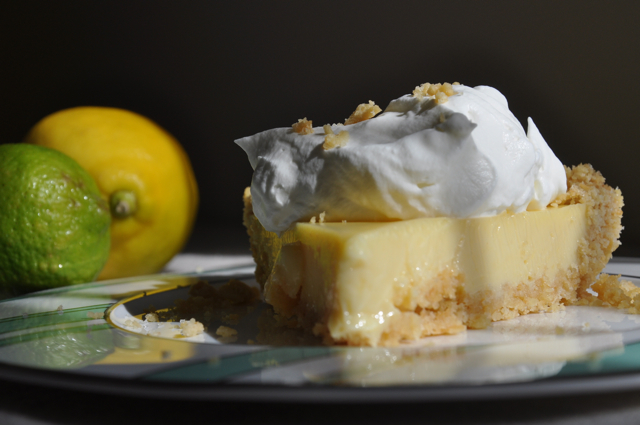 According to Bill, who grew up in New Bern, North Carolina and vacationed at Atlantic Beach when he was young, there’s a long standing North Carolina tradition of serving lemon pies at coastal seafood restaurants, even when there are no other desserts on the menu. He remembers being told, as a child, that if you ate dessert after a seafood meal you might die, a ruse, he suspects, designed to curtail his fondness for sweets. Lemon pie, for some reason, was the exception. Bill says that the original versions of Atlantic Beach Pie had a meringue topping; he prefers whipped cream and a sprinkling of sea salt. 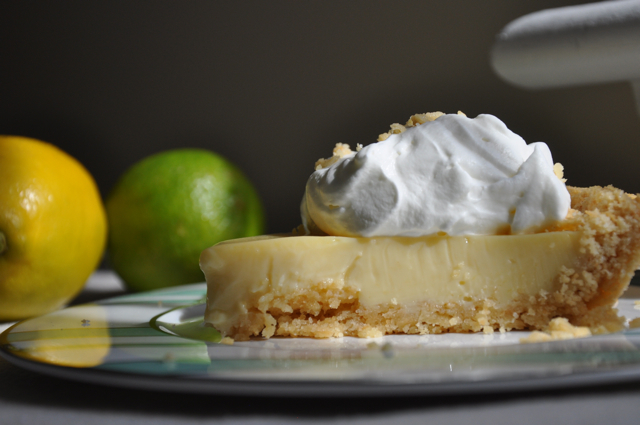 The filling itself is closely modeled after key lime pie, and is made with either lemon or lime juice or a combination of the two. But it’s what’s under the filling that makes this Atlantic Beach Pie so unique: a semi-sweet crumb crust prepared with crushed saltine crackers, something I’d never tried or even considered. It sounds kind of blah at first – at least it did to me. When I think of crumb crusts I think graham crackers, or vanilla wafers, another cookie or nuts. Why start with something as boring as saltines? But I was pleasantly surprised by the way the crust worked out. It doesn’t have the sweetness or even the texture of a traditional cookie-style crumb crust. Rather, it’s more coarse, crunchier, and not too sweet – just the right foil for the rich, sweet-tart citrus filling. He says the pie is so popular with his guests that he’ll never be able to take it off the menu. If you’re ever in the Chapel Hill area, you should visit Crook’s Corner. I haven’t been, but I’m anxious to get there. Meanwhile, when you get a moment you should watch this video of Bill Smith talking about his restaurant and preparing Atlantic Beach Pie. He’s charming and a straight shooter and I think you’ll enjoy it. Be sure to chill for at least 4 hours once the pie has cooled to room temperature. Crush the crackers by hand or in a food processor. I like to break them into a gallon size freezer bag, partially seal the bag, then finish the job by rolling over the bag with my rolling pin. Keep the crumbs a bit coarse, not too fine. Transfer to a large bowl. Mix in the sugar. Add the butter to the crumbs. Using your hands, vigorously rub the butter with the dry ingredients until evenly mixed. When you squeeze the mixture in your hands, it should be somewhat clumpy. Spread the crumbs out in a standard - not deep-dish - 9-inch pie pan and press them in evenly. Refrigerate for 15 minutes. Preheat the oven to 350°. Bake the pie shell on the middle oven rack for about 18 to 20 minutes. It should be just starting to turn golden brown. Transfer to a cooling rack. Combine the sweetened condensed milk and egg yolks in a large bowl. Whisk thoroughly for about a minute. Whisk in the lemon or lime juice until smooth. Pour the filling into the crumb crust. Bake on the center oven rack for about 18 minutes. (There are virtually no visual clues that the filling is done; it's best to go by the total elapsed time.) Transfer the pie to a rack and cool throughly. Cover with loosely tented foil and refrigerate for at least 4 hours or overnight. When you're ready to serve the pie, whip the heavy cream in a medium bowl, adding sugar to taste. Slice and serve the pie with a generous dollop of whipped cream. Garnish very lightly with the salt, if using.